"Yum!" was the first word my husband and children said after one bite of these eggs on Sunday and I had to agree. 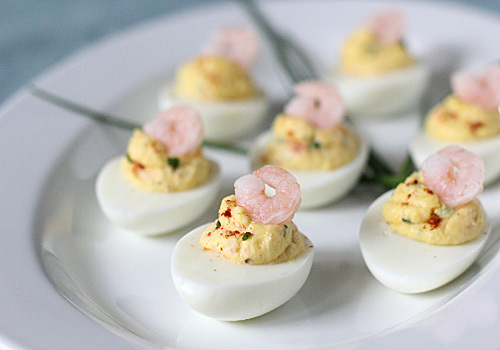 After rave reviews from the smoked salmon deviled eggs, I wanted to put a similar spin on the classic version, but with shrimp in mind. Knowing how much my family loves my shrimp and sherry cheese spread, I took a few pointers from that recipe and came up with these. Instead of the traditional dash of paprika, I like to put a little devil back in deviled eggs with a good hit of cayenne pepper. It is optional of course, but highly recommended. I garnish each egg with a small bay shrimp for two reasons... 1. It looks and tastes good and 2. It lets people know what the main ingredient is in case there are any shellfish allergies. Many of you may be hosting a brunch or luncheon this weekend to honor and remember the mothers in your lives. These would certainly be a wonderful bite-sized food to pass or serve buffet style. Cut the eggs in half lengthwise. Remove the yolks and place them in a food processor fitted with the metal blade. Add the mayonnaise, cream cheese, mustard, lemon juice, and sherry and process until smooth. Add the shrimp and process to break down the shrimp into small pieces. Add the chives and pulse to combine. Season to taste with salt and pepper. Spoon the filling into the whites or pipe the filling using a pastry bag and tip. Sprinkle with cayenne pepper and garnish with a shrimp. Refrigerate until ready to serve. Set out at room temperature for 20 minutes before serving. Enjoy! 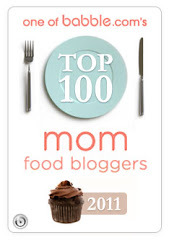 My kids would think I am the coolest mom ever if I made these. 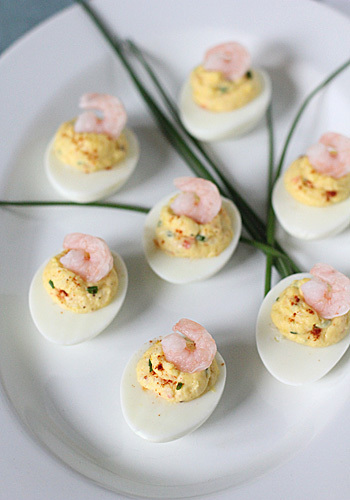 I love deviled eggs and the shrimp on top is genius. I just made these this morning for our office Christmas party. Wonderful! Can't wait to make them for my family at Christmas. Rich and deliciously shrimpy. So pleased you enjoyed them. Thanks for letting me know!